The elimination of bots may seem more difficult than the eradication of Polio. When one botnet gets taken down, another botnet with more sophistication takes over and does not miss a beat. As long as there are profit-driven organized cyber-crime rings, then there will be malicious activity that threatens business-critical applications. Join Imperva and (ISC)2 on March 24, 2016 at 1:00PM for the first part of a three-part Security Briefing where we'll examine the types of automated attacks that impact business operations today and the importance of globally, crowd-sourced threat intelligence in the defense against such threats. Data capture, storage, and usage continues to grow at exponential rates. As a result, and in an effort to obtain operational efficiencies, many new organizations are “born in the cloud”, while for others, the migration of data and data driven business processes to cloud environments continues to escalate rapidly. The use of third party database and related cloud service offerings to support cloud and hybrid environments is also growing and evolving. However, security teams consistently report concerns with respect to the lack visibility and oversight of their data in the cloud. Typical questions being asked by CISOs are complex and not easy to answer. Join Imperva and (ISC)2 on May, 23, 2019 at 1:00PM Eastern for an examination of these questions and how to address them effectively. Securing your infrastructure can sometimes feel like navigating a ship at night in a storm, with pirates attacking. An occasional flash of lightning allows a quick glimpse of the intruders, but you never really know when or from where the next attack is coming. What if you could illuminate the best path forward? A centralized platform gives you a single window with pervasive visibility into all network traffic – both north-south and east-west which allows improvement to the effectiveness and efficiency of all your security tools and better manage SSL decryption as well as NetFlow generation. Join Gigamon and (ISC)2 on May 2, 2019 at 1:00PM for a discussion on how to discover applications on your network you didn’t know where there, spotting potential security vulnerabilities before they become a problem and see a live demo of how you can optimize security and network performance. In this era of rapid modern application development, organizations often deploy code into production with critical vulnerabilities that often lead to exploitation by cybercriminals. These bad actors are on the look-out, scanning for vulnerabilities that will allow them to establish a silent foothold into your environment. 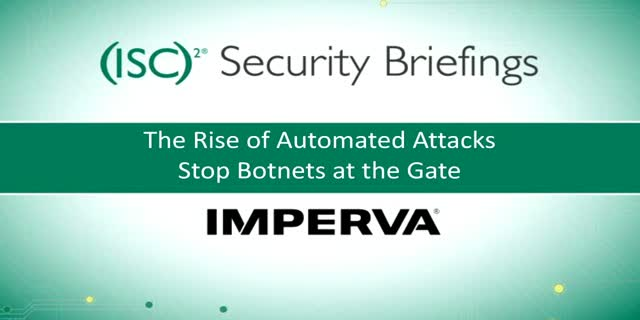 Join Imperva and (ISC)2 on April 25, 2019 at 1:00PM Eastern and discover a defense in depth security strategy to protect your most valuable web applications and your business from damaging cyber-attacks. Today, most security teams struggle to identify and locate threats in their networks. Without the ability to find the bad actors in the network, security teams are unable to be effective in their roles. Organizations need tools to link intelligence about threats in the wild, threats in your network, and understand unique signals from both. In this webcast, we’ll examine the latest trends and downfalls in this space, and how Chronicle, an Alphabet company, is looking to solve them at a global scale with a focus on speed and efficacy. We’ll also have a demo of the Chronicle security platform, Backstory and how it can help streamline your security. As the insatiable demand for bandwidth drives the need for faster networks, organizations still need to inspect and enforce network security policies at wire speed. And that is particularly challenging when you are upgrading networks from 10GB to 40GB or from 40GB to 100GB. Join Gigamon and (ISC)2 on April 4, 2019 at 1:00PM Eastern as we discuss how to solve the security headaches that go with these network upgrades and new architectures that strengthen your security posture, simplify IT and reduce costs. We’ll also discuss how to increase your security ROI, reduce your security risk and improve threat response. Data breach(es) remains atop the list of any CISO’s main concern. With the exponential growth of users, apps, and data, that leads to more and more legitimate data access, the attack surface expands making it harder to determine whether a data access is appropriate. Many organizations rely on traditional perimeter-based security approach, but they’re still getting breached. Additionally, trying to constrain and control the interactions between users and data by locking down usage can not only slow down business, but also frustrate users. Due to this, they may decide to work around you, creating an even bigger risk for your company. Join Imperva and (ISC)2 on March 28, 2019 at 1:00PM Eastern to learn about some best practices to mitigate data breach risk without decelerating your business growth. Today’s sophisticated cybersecurity attacks often unfold in the blink of an eye. To respond quickly, your security teams need to see security incidents as they happen to ensure that attempts to hack your server environment are thwarted before entry into your machines. Whether detecting malware, helping to prevent and disrupt command and control communication, ransomware and phishing attacks – DNS can help with this and much more. But are you leveraging it as part of your cyber strategy? Nearly all threats use the DNS system therefore threats in your network can easily be seen in your DNS data. Join Infoblox and (ISC)2 on March 21, 2019 at 1:00PM Eastern as we bring in experts from IDC and ELEVI for a discussion on how leveraging DNS can help identify attacks as they happen or even prevent them before they happen, remediate attacks faster, and help detect and stop malware from spreading. Ever wonder how network traffic analysis (NTA) can reduce and harden an organization’s attack surface? In this webcast, the Director of Information Security at Accolade present a case study on how they use NTA to audit their security hygiene in real time, assuring that current standards for handling regulated data are being followed, and that all apps, services, and devices follow established security protocols to proactively reduce the chances of a data breach. Attack and Control frameworks provided by such organizations like NIST, CIS and MITRE can help enterprises to improve, understand their capabilities and build better security. Join ExtraHop and (ISC)2 for a webcast on how to leverage these frameworks to better understand how network traffic analysis can provide the visibility and actionable insights to accelerate an enterprise's success at increasing security maturity. Your enterprise network relies on a vast assortment of security devices and solutions, each generating their own alerts. More often than not, security teams don’t have the resources to address every one of them in a timely manner. According to a 2017 EGS report, keeping up with the enormous volume of security alerts and a lack of integration are the biggest network security challenges enterprise's face. Join Infoblox, their special guest Optiv and (ISC)2 on February 7, 2019 at 1:00PM Eastern , for a live discussion on how organizations can leverage ecosystem integrations to bridge islands of security, while automating incident response through automation and orchestration. Security budgets continue to tick upward, but underneath the hood, increasingly hybrid architectures in enterprise IT are driving shifts in where that money is applied. GDPR has driven compliance to the forefront of security project decision making, while other pain points including user behavior and lack of qualified personnel drive specific security product deployments. Security resistance to cloud continues to decrease, while the endpoint security space remains both relevant and increasingly crowded. Join Daniel Kennedy, Research Director for 451 Research on January 29, 2019 at 1:00PM Eastern as he walks through highlights of 451's 2018 surveys and interviews of information security professionals. Most organizations have multiple products and services, from multiple vendors and suppliers to address their cybersecurity needs. The lack of integration and inability to share critical information results in silos of technology that cause inefficiency, lack of agility, limited visibility and a poor security posture. How can an organization solve and streamline this improve their cybersecurity operations? Join Infoblox and (ISC)2 on January 10, 2019 at 1:00PM Eastern for an examination of how Infoblox and Fortinet have joined together to assist organizations in improving their security operations and reducing time to containment. When it comes to making access decisions, it’s all about being smart. In the speed of today’s business agility requirements, we cannot stop users at the door all the time and ask for their ID. We need to know them. Intelligent Authentication provides the benefit of reducing friction AND adding security to protect applications and data that are critical to the business. It provides security and convenience, considering the needs of the modern workforce. In this session we will discuss a simple process to gain visibility into the right listening posts, derive actionable insights and then drive action to protect the organization’s most valuable assets from rogue access and drive Identity Assurance. Ever heard the expression, “you can’t hit what you can’t see?” Well that sentiment rings true when it comes to protecting access to critical resources. You can only secure what you actually take steps to protect. .As such, secure access needs to be pervasive and cover all access user cases, regardless of whether applications and resources live on-premises or in the cloud. And because it’s likely have both, you need a solution that works equally well across these hybrid environments. In this session we will explore five critical secure access use cases, and how you can achieve a high-level of identity assurance that users are who that claim to be so that you can avoid falling victim to the next wave of credential-based attacks. The market demands for the modern approach to authentication is more like “Have it your way!” That’s why many of the approaches and offerings can only do one thing. Those apps will become obsolete or acquired as Access Management vendors will face the complex reality that enterprises who want modern authentication will also want access that’s convenient, intelligent and pervasive – not just 2FA or SSO. In this webinar, RSA will examine how to leverage a trusted, secure access platform that provides access to all users, to all apps from anywhere at any time in a smart, secure and noninvasive way. Someone in leadership always seems to ask the question “How can I tie my threat hunting activities to real impacts for the organization?” Threat hunting programs are encouraged as part of a mature and successful incident response capability and teams invest significant time and effort in the development and maintenance of that program. However, management is always looking for metrics to demonstrate the value of threat hunting in real terms due to the number of hours consumed by such highly skilled professionals. It’s a big investment. Join Gigamon on November 1, 2018 at 1:00PM Eastern for an examination of how to demonstrate value from threat hunting operations with practical methods and examples for tracking hunting operations, reporting and attributing outcomes to industry-leading frameworks and plot hunting goals and coverage across the MITRE ATT&CK framework. As your infrastructure has grown to include a mix of physical, virtual and cloud environments with increased network speeds and volume of data, so have the threats increased to your attack surface with more vectors to breach your organization. This challenges your network and security operation teams and tour traditional network packet broker needs to evolve from providing network visibility to also helping strengthen your security posture. Join Gigamon and (ISC)2 on October 18, 2018 at 1:00PM Eastern where we will examine the acquisition and aggregation of data from your physical, virtual and cloud infrastructure, filtering of traffic to provide the right data to the right tools, transforming your data with masking, header stripping and SSL decryption (TLS1.3) to ensure compliance, threat prioritization by providing context and bridging the gap between NetOps and SecOps. (ISC)2 Security Briefings - In-depth examination of infosec topics. (ISC)2 Security Briefings brings attendees multi-part series on cutting edge infosecurity topics that gets deeper into the subject matter and technologies presented by subject matter experts.